Koreans have lamented their relative inefficiency for years, and the government has repeatedly tried to humanize the education system  simplifying admissions tests, capping hagwon tuition, even going so far as to ban hagwons altogether during the 1980s, when the country was under a dictatorship. But after each attempt, the hagwons come back stronger. That's because the incentives remain unchanged. South Korean kids gorge themselves on studying for one reason: to get into one of the country's top universities. The slots are too few  and the reward for getting in too great. "Where you attend university haunts you for the rest of your life," says Lee Beom, a former cram-school instructor who now works on reform in the Seoul metropolitan office of education. But this time, the administration argues, its reforms are targeting not just the symptom of the dysfunction but also the causes. It is working to improve normal public schools by putting teachers and principals through rigorous evaluations  which include opinion surveys by students, parents and peer teachers  and requiring additional training for low-scoring teachers. At the same time, the government hopes to reduce the strain on students. Corporal punishment, an entrenched and formalized ritual in South Korean schools, is now prohibited (although students told me it still happens occasionally). Admissions tests for prestigious, specialized high schools (like foreign-language schools) have been eliminated. Middle schoolers are now judged on the basis of their regular grades and an interview. And 500 admissions officers have been appointed to the country's universities, to judge applicants not only on their test scores and grades but also other abilities. No one defends the status quo in South Korea. "All we do is study, except when we sleep," one high school boy told me, and he was not exaggerating. The typical academic schedule begins at 8 a.m. and ends sometime from 10 p.m. to 1 a.m., depending on the ambition of the student. To be sure, some students opt out of this system  those who go to certain vocational high schools, for example. But most cannot transcend the relentless family and peer pressure to study until they drop from fatigue. "It breaks my heart," another teenage boy tells me, "to see my classmates compete against each other instead of helping each other." Parents remain the real drivers of the education rat race, and they will be the hardest to convert. 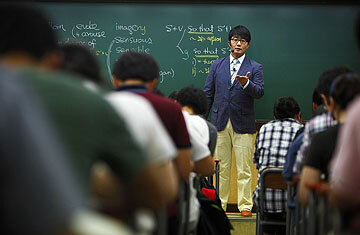 Han Yoon-hee, an English teacher at Jeong Bal High School in Ilsan, a suburb of Seoul, says parental anxiety is profound. "I suggest to [my students] that they should quit hagwons and focus on school," she says. "But their parents get very nervous when they don't take classes at night. They know other students are taking classes. They have to compete with each other." Sometimes it's hard to know who is competing with whom  the students or their mothers. In 1964 a school entrance exam contained a question about the ingredients in taffy. But the exam inadvertently included two right answers, only one of which was counted as correct. To protest this unfairness, outraged mothers  not students  began cooking taffy outside government offices using the alternative ingredient. Eventually, the mothers won the resignation of the Vice Education Minister and the superintendent of Seoul, and several dozen students received retroactive admission offers. Still, the Education Ministry can point to one recent victory in this long fight: spending on private instruction decreased 3.5% in 2010, the first drop since the government began tracking the figure in 2007. Does the decline signal a trend? Well, Koreans still spent 2% of their GDP on tutoring, even with the downtick. Andrew Kim, a very successful instructor at Megastudy, South Korea's largest hagwon, says he earned $4 million last year from online and in-person lectures. He agrees that the system is far from ideal, but so far he has seen no impact from the reforms on his income. "The tougher the measures," he says, "the more resilient hagwons become." In response to the government-imposed curfew, for example, many hagwons have just put more lessons online for students to buy after hours at home. Other hagwons flout the law, continuing to operate past the curfew  sometimes in disguise. The night of the Daechi-dong raid, the inspectors I am following wait for the door to open. Then they take off their shoes and begin a brisk tour of the place. In a warren of small study rooms with low ceilings and fluorescent lights, about 40 teenagers sit at small, individual carrels. The air is stale. It is a disturbing scene, sort of like a sweatshop for children's brains. This is technically not a hagwon but an after-hours self-study library  at least in theory. Self-study libraries are allowed to stay open past 10 p.m. But the inspectors suspect this is a camouflaged hagwon. The students are studying from the same work sheets, and there are a handful of adults who appear to be teachers. One of them denies any wrongdoing. "We are just doing our own work here," she says indignantly. "We don't teach." Cha, the squad leader, shakes his head. "I've allowed your excuses before, but we're getting too many tips about this place," he says. "It's an open secret in this community that you've been operating illegally." Afterward, the squad makes a few more stops at other self-study libraries. It finds nothing suspicious. At about midnight, Cha lights a cigarette on a corner and chats with his colleagues. Then they head home for the night, having temporarily liberated 40 teenagers out of 4 million. This article originally appeared in the October 3, 2011 issue of TIME Asia.